The Warehouse Group is one of New Zealand’s largest retailers and sells a range of products from clothing and technology to grocery items. Established in 1982, they have 86 stores throughout the country and employ more than 8,500 people. The Warehouse Group transformed the way it manages employees’ mobile charges. They were already using Fraedom to track, view and code their operating expenditure, so the natural solution was to extend this to their telecoms services. Complete visibility of all mobile call and data spend. Efficient identification of redundant accounts and phones no longer in use. Reduced annual telecoms expenditure by 17%. 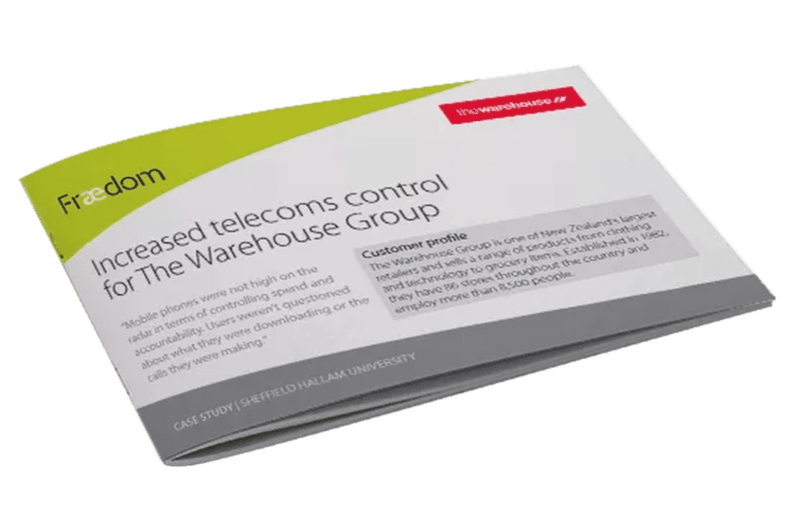 The Warehouse Group made considerable savings simply by extending their Fraedom.com services to cover their mobile phone transactions as well as their operating expenses. The company has been able to put standard policies in place that make it easier for employees to manage their personal call spend. Managers around the business now have full visibility of all phone spend and can access the data quickly and easily, via an online tool. In addition, the company has managed to reduce costs on an ongoing basis. Now, with Fraedom.com, we have real user accountability and management visibility and control”.